Good morning, after a wonderful week at the BEACH!! Shell collecting, reading, and otherwise relaxing while my girls played with grandparents, aunt, uncle, and their near-to-grown-up cousins…I begin this weekend refreshed and relaxed, and having done some window shopping of my own. We’ll continue our July 4th celebration with family, and will be crafting ALL WEEK next week to prepare. 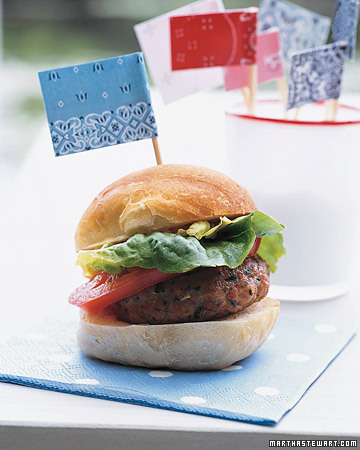 Here are some more 4th of July, red white and blue party ideas that might strike your fancy… that we’ll be dressing up in that Recession Home thrifty style. 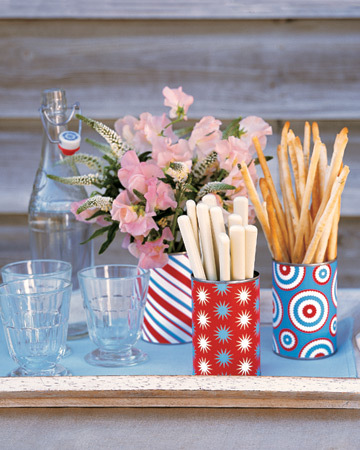 But I think I’ll use the cardboard toilet paper tubes I’ve been saving, and wrap them with some home-made red white & blue paper decorations… We’ll see if they’re anything NEAR as cute as yours… She’s Martha, after all–but if I can save 15.00 I’m going to try! We'll be riding these around, and scooters, too!!! I can do these. Gross Grain Ribbon... we can DO this!!! Fabric Stars for your 4th of July Party!!!! RE-USE-ABLE!!!!! Daytime Fireworks, she calls them. <3 it. OOOOHOOHOOOH!!!! Look here!!! I can do these!!!!! 4th of July Tissue Paper Fans - Red White & Blue! We are SO going to be busy, preparing all these decorations next week!!! I’m considering a bandana table runner, or the paper star table runner… undecided on that one. ALSO, trying to figure out what to do with the lanterns. We can do those better, I think. See anything you like that you need help crafting? I’m happy to sew, glue gun, or create for you!